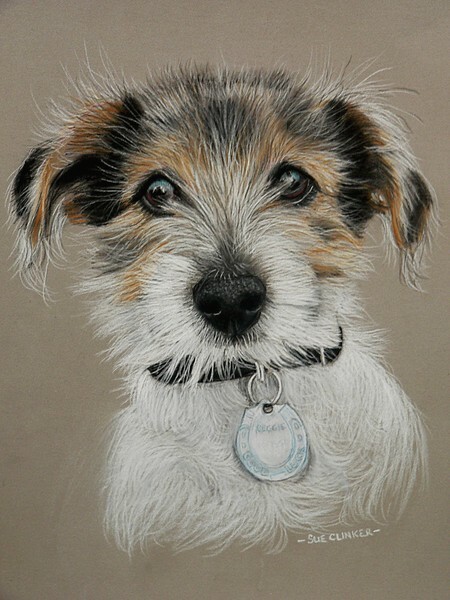 Commissioned portrait of a rescue Jack Russell puppy ... I've been told another portrait will be required when Reggie is a bit older ... I've had the pleasure of meeting this little chap and he is soooooo cute! You are so talented! Your work is crisp, clear and precise. A true artist. I hope the nerve in your neck has calm down, I know how frustrating it can be. could not be cuter,is the paper velour? Artist Reply: Thanks Ruth. Apologies for delay in responding - I have trapped nerves in my neck which have prevented me drawing/using keyboard/computer much in recent weeks. On the mend slowly but I'm getting very frustrated as I miss my art! I used Clairefontaine Pastelmat for this pastel drawing.